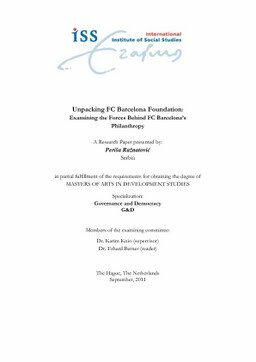 This paper examines the motivations behind the decision of a football club, such as FC Barcelona to get involved in the sport-in-development field by establishing and running a charitable organization – FC Barcelona Foundation. Applying new institutionalist approach to the historical narrative, this paper will challenge the existing justifications regarding the work of Barca’s philanthropic initiatives. Using a historical institutionalist approach, this research will provide an explanation that is attentive to the context in which FC Barcelona is embedded. This study offers an in-depth examination of the relationship between the two major forces that were determinant in the creation of Barca’s key policies, including the one regarding FC Barcelona Foundation.